At each phase of the process, there are steps to validate the procedures and ensure compliance with current quality measures and standards. 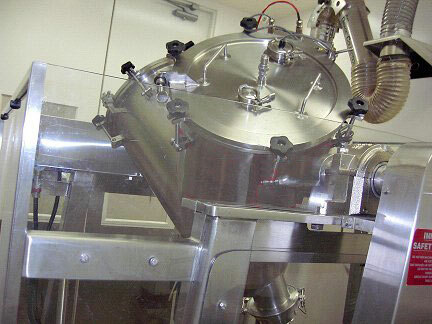 The result of implementation is increased blending knowledge and improved uniformity of formulations. The ESP™ pharmaceutical blend uniformity monitoring system unlocks a wealth of new information about your formulations – and vastly improves your blending knowledge. This new insight into your process allows refinements within Standard Operating Procedures (SOP) or variations to SOP to optimize uniformity. Case 1 represents a situation where the blend is stopped at the point it reaches uniformity, but it is unknown what might happen to this blend if conditions change. In Case 2, variability in optimal blend time would not influence product quality. A window of acceptable times is possible compared to Case 3 where any variation can move the operation away from ideal. Case 3 represents a clearly overblended situation. By understanding the problem, changes can be made to adjust the system so that the blend time corresponds to the stop time. Based on information provided by the ESP™, adjustments can be made within the Standard Operating Procedure (SOP) to effectively slow the blending process. As represented in the graph above, this stretches the “funnel” and ensures uniformity - the point of lowest standard deviation between readings of the 8 sensors - is optimized at the conclusion of the fixed blend time. Maximum uniformity of the formulation is easily obtained if changes to the SOP are undertaken. In this example, decreasing the blend time to the point of lowest standard deviation between readings of the 8 sensors will achieve the desired result. A key benefit of the ESP™ system is that it can be retrofitted to existing equipment – eliminating the need for significant capital cost expenditures. To permit maximum flexibility, the sensors can be retrofitted into the walls or covers as appropriate, depending on the blender size and type. Once installed, the stainless steel sensors are flush with the inside surface of the blender, and can be easily removed for maintenance and cleaning. 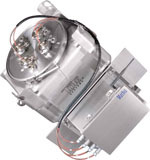 The stainless steel sensors of the ESP™ can be retrofitted to existing V-blenders and bin blending equipment – on the covers or side walls. The flush mounted sensors are designed to be simple to clean and maintain.